The Philips Brilliance 16 mobile CT scanner is a high-performance imaging system that’s known as one of the top models for everyday CT scanning. Although there are more advanced models available, it’s hard to find a system that combines efficiency, image quality, and affordability like the Philips Brilliance. This system offers average scan times of 0.4 seconds, as well as fully gantry rotations, a temporal resolution as low as 53msec, and reconstruction rates of 20 images per second. Furthermore, with its patented MRC X-ray tube, this scanner provides the necessary heat capacity that allows for longer scan times and thin-slice imaging. This Brilliance mobile CT scanner also aims to optimize patient comfort and protection, featuring the Philips DoseWise approach that’s designed to help achieve maximum dose efficiency without compromising the system’s image quality. In terms of efficiency, the Brilliance Workspace helps users to process advanced clinical applications and large data sets in a streamlined, easy-to-use manner. A used Brilliance 16 multislice CT is one of our top CT scanners. 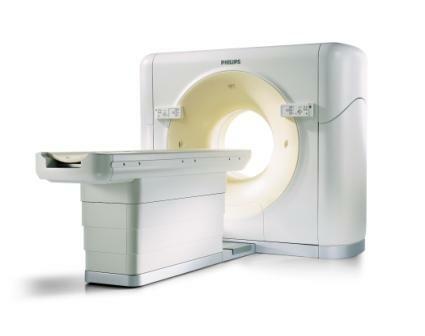 Because of the high competition and high prices in the 16-slice CT market, we recommend the Philips Brilliance 16-slice CT scanner because of its price. It provides excellent image resolution while being more affordable than other options available. Our customers find this system to be user-friendly, fast, and excellent in a busy environment.